IOTransfer 3 provides a 1-click solution to easily transfer photos, music, videos, and contacts from your iOS device to PC. It also helps you import, export, and delete other contents, such as Books, Audiobooks, Podcasts, Voice Memos, Apps in the MANAGE tab Thus, it is a perfect iTunes alternative. 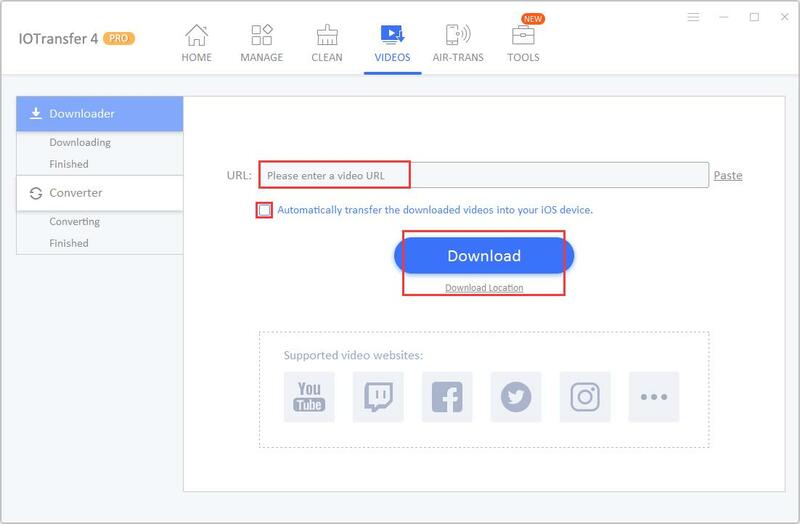 Additionally, the optimized VIDEOS feature supports downloading various videos from more video websites to your iPhone/iPad/iPod and PC so that you can watch them offline. The improved CLEAN feature supports to clear more caches and junk files on your iOS device to free up more space. 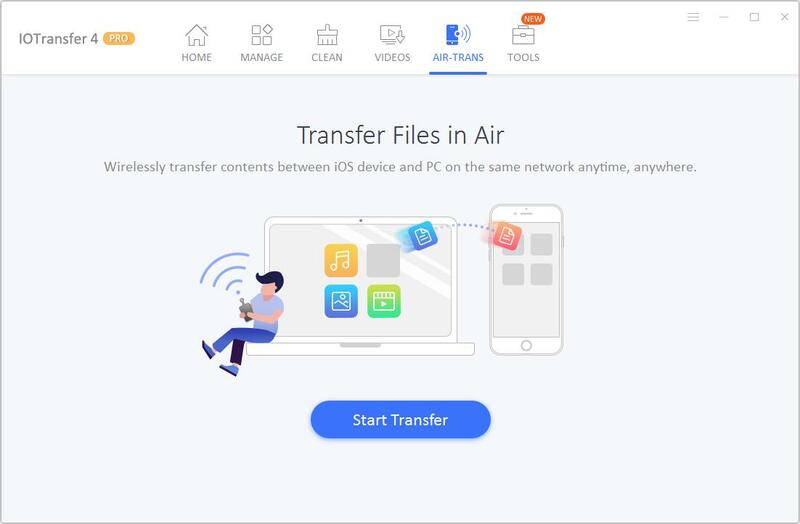 The newly developed AIR-TRANS, which adopts WiFi Direct technology, allows you to quickly and wirelessly transfer photos, videos, and other files between iOS device and PC on the same local network. What's more, the newly added Converter feature in VIDEOS helps you effortlessly convert video files into various file formats including audio file formats and automatically transfer them to your iOS device. No need to worry about unsupported video file format anymore. Last but not least, IOTransfer 3 has a brand-new user interface, which is more intuitive and easier for operation. 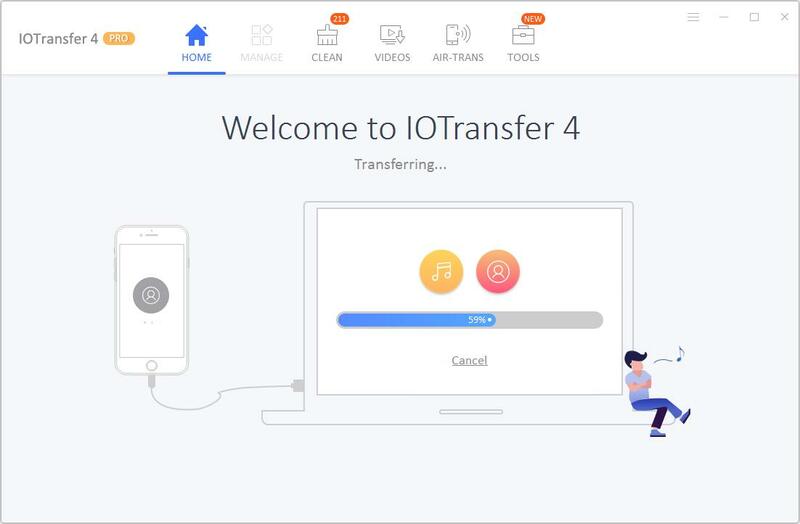 To know more features of IOTransfer 3 and how to use it, please continue reading this user manual. 1) Click here to download the latest IOTransfer 3. 2) Double-click the downloaded iotransfer_setup.exe to start the installation. Pro users can always enjoy the latest version automatically with Update automatically checkbox ticked by default in the Settings. Free users can manually update IOTransfer 3 by selecting Check for updates in Options at the top right. 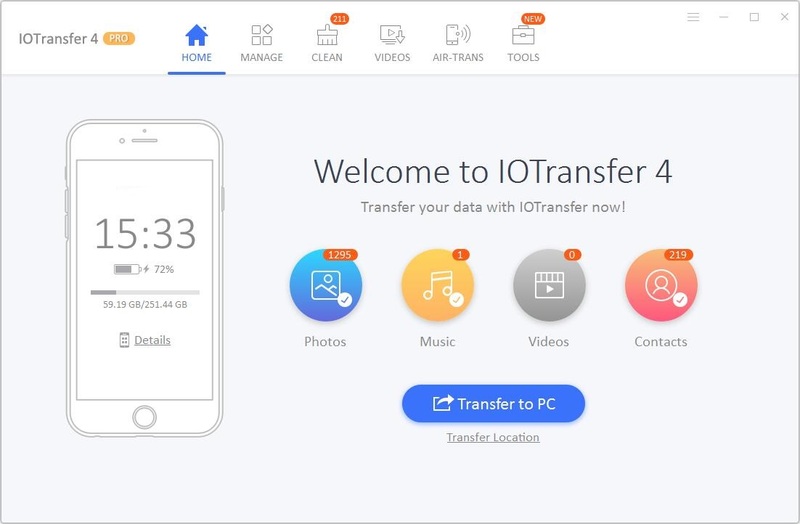 New users have a 7-day trial to try all the functions of IOTransfer 3 and evaluate if it meets their expectations. After the trial expires, a valid license code is required to activate the full version. Click here to purchase one. 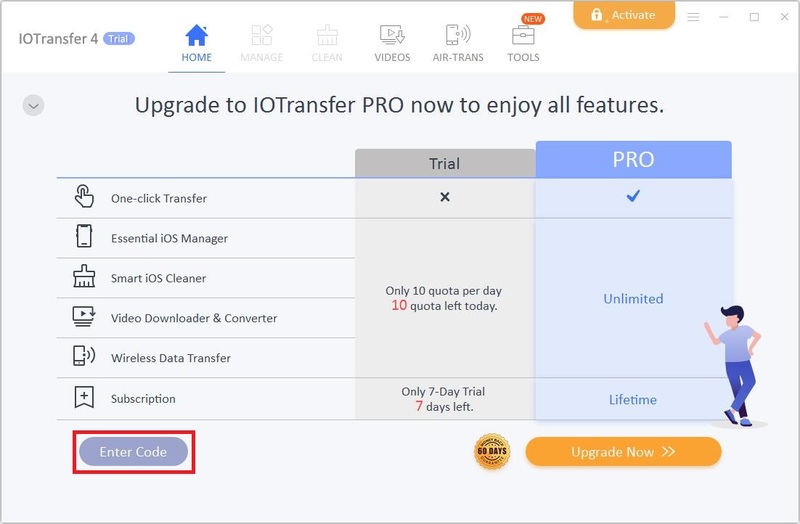 Click at the top right of IOTransfer 3 main screen, find the Enter Code button to enter your license code, and then click the Activate button to activate IOTransfer 3 Pro version. Visit here for step-by-step activation instructions. 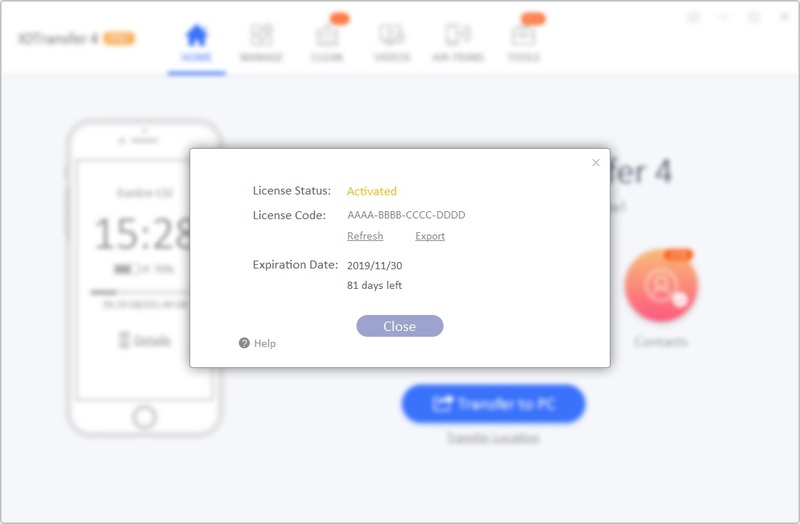 After upgrading to the full version, you can click Options at the top right of the screen and select License to check the detailed license status, refresh your license, or export your license. When you open IOtransfer 3, it will detect your connected iOS device automatically. 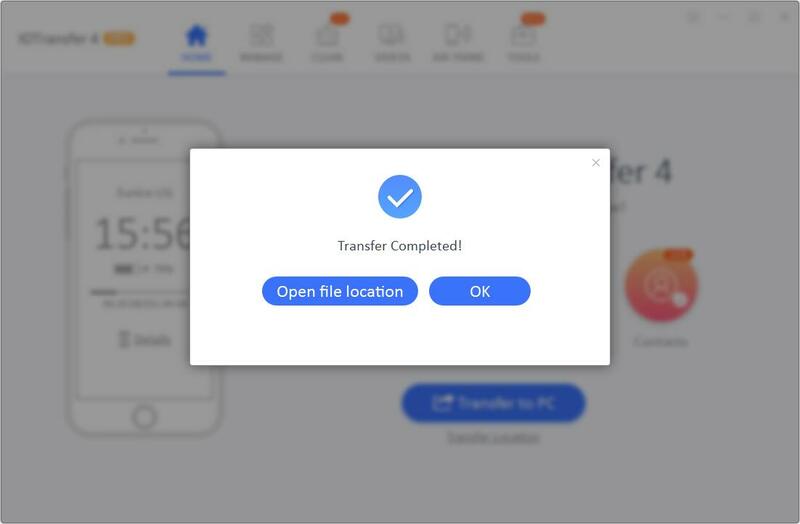 If you have not connected your iOS device to the computer, IOTransfer 3 will prompt you to connect your device with the USB cable as the screen shown below. 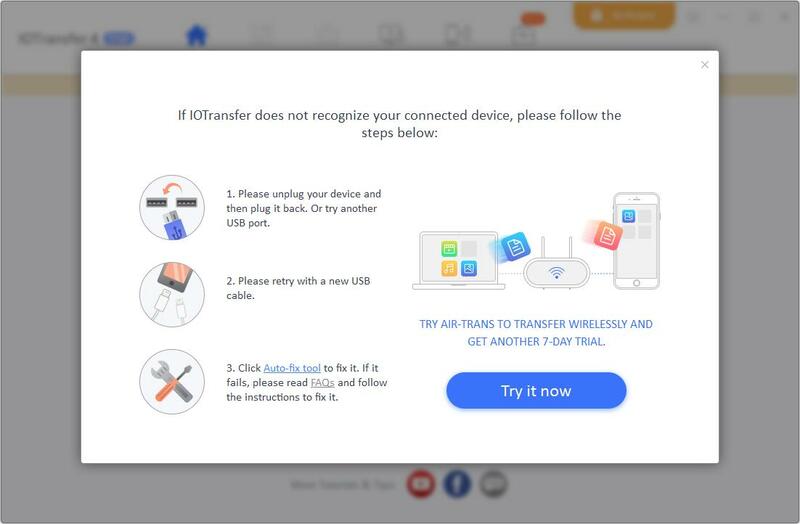 If your connected device is not recognized by IOTransfer, please click the text link fix it and follow the on-screen prompts to fix the issue. 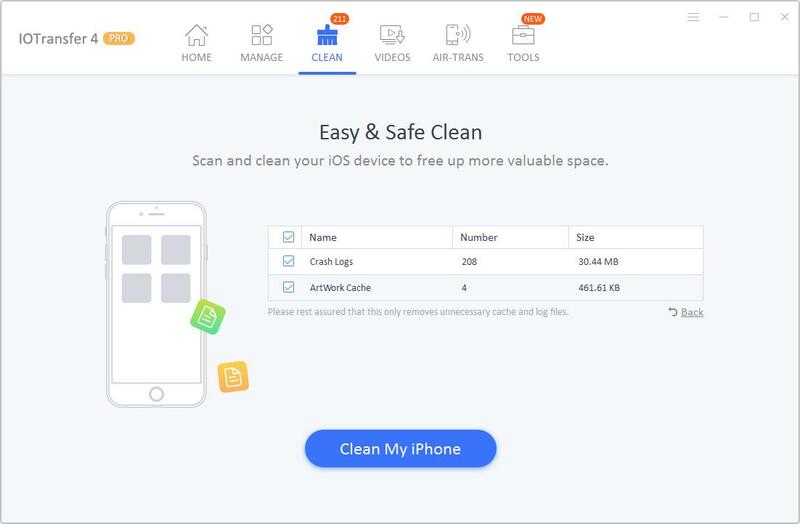 When your iOS device is recognized by IOTransfer 3, you will see the following main window which displays six main features: HOME, MANAGE, CLEAN, VIDEOS, AIR-TRANS, and TOOLS. Home is shown by default when you open IOTransfer 3. This menu icon is at the top right corner of IOTransfer 3. It provides access to Settings, License, Send Feedback, User Manual, Technical Support, Check for Updates, What's new, and About. On the left of the HOME window, you will see some basic information about your iOS device. If you want to know more info about your iOS device and storage usage, please click the Details link. On Home screen, you can transfer Photos, Music, Videos, and Contacts to your computer easily by just clicking the "Transfer to PC" button. If you don't want to transfer all the four categories, just click the corresponding categories to unselect them. By clicking Transfer Location under the button of Transfer to PC, you can choose where to save the transferred files. When the transfer finishes, you can choose Open file location to check the transferred files or click OK to close the window. 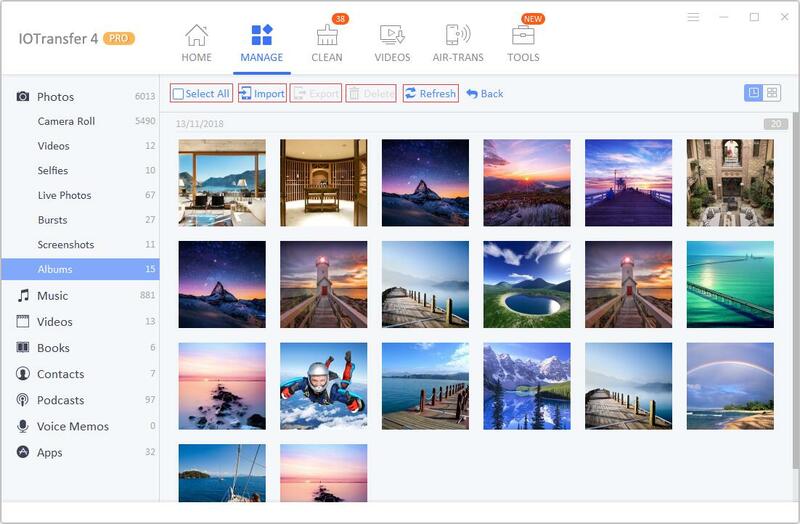 IOTransfer 3 supports to manage 8 kinds of contents: Photos, Music, Videos, Books, Contacts, Podcasts, Voice Memos, and Apps. The Photos part provides easy access to 8 categories: Camera Roll, Videos, Selfies, Live Photos, Panorammas, Screenshots, Animated, and Albums. - You could type the file name here to find the file quickly. - You can click here to switch the view type. Preview: It allows you preview the selected item before further operation. Import: It can import data from your computer to your iOS device. Export: It can export data from your iOS device to your PC. Delete: It will delete the unwanted data from your iOS device to free up more space. 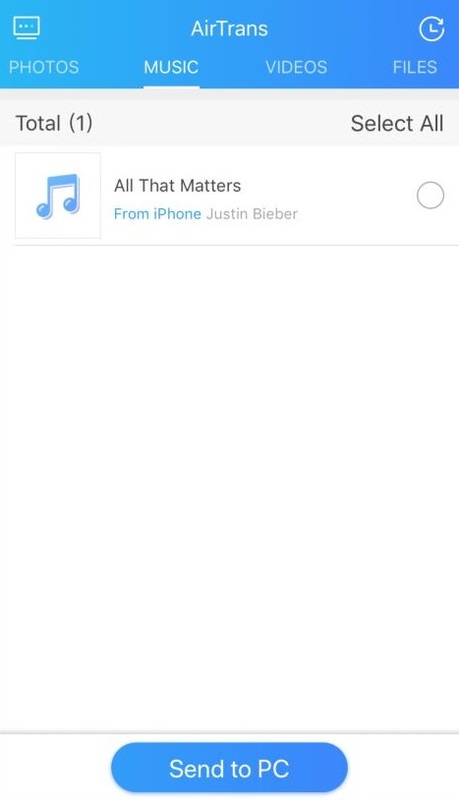 Refresh: It can refresh the applicable changes. 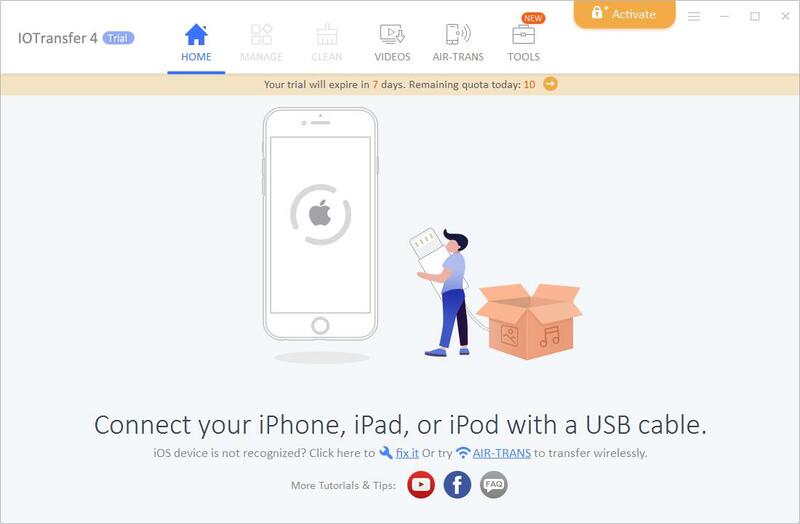 IOTransfer 3 offers a 1-click solution to clean and speed up your iOS device. 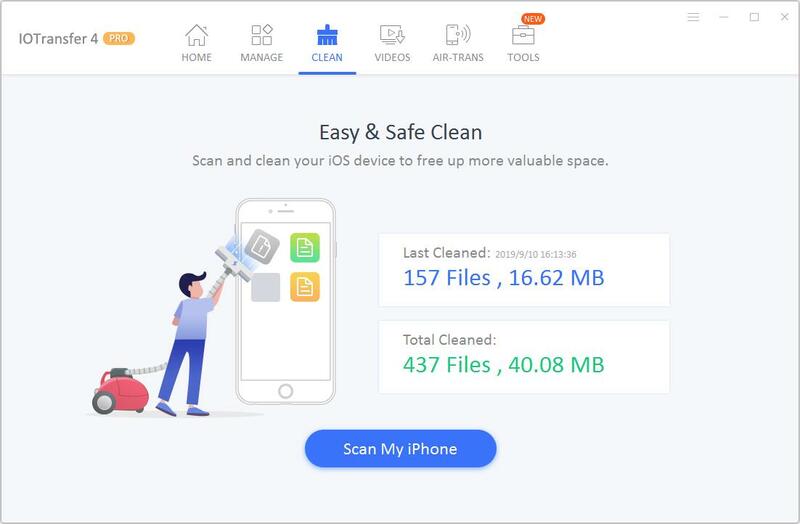 To clean up your iOS device junk files, you only need to click the Clean My iPhone/Clean My iPad /Clean My iPod button at the middle bottom. If you want to check what will be cleaned, please click the Details link. After the cleaning is completed, it will show you the Cleaned result. By clicking the Done button in the result window, you can have an overview of the Last Cleaned result and the Total Cleaned Result. This module helps you download online videos, convert videos to different file formats, and transfer the downloaded and converted videos to PC or iDevice automatically. This tab contains two features: Downloader and Converter. Downloader supports downloading your favorite online videos from the video sites and then automatically transferring them to your iOS device and PC. Step 1: Go to the video websites to copy the URL of the video you want to download. Step 2: Paste the URL into the URL box. Or you can just click the Paste text link to automatically enter the URL. Step 3: Tick “Automatically transfer downloaded videos into your iOS device” if you also want to watch videos on your iDevice. Step 4: Click “Download Location” to set where to save the downloaded videos. Or ignore this step if you prefer the default settings. Step 5: Click the Download button to start the process. During the downloading process, you can pause the download by clicking the video picture. Right-clicking the downloading video will give you three options: Pause, Open local folder and Delete. When the download finishes, you will find the downloaded video in the Finished list with detailed information. Right-clicking a downloaded video will give you four options: Transfer to device, Open local folder, Delete, and Delete all. Converter feature helps you convert the video into various file formats and save them to your PC or your iOS device. Step 1: Click Add Files to select the videos you want to convert. Step 2: Click Output Format to choose the output format. Step 3: Tick “Automatically transfer the converted videos into your iOS device” if you also want to watch videos on your iDevice. Step 4: Click “Convert Location” to set where to save the converted videos. Or ignore this step if you prefer the default settings. Step 5: Click the Convert Now button to start the process. In the converting process, you can see the video information and pause the convert by clicking the video picture. Right-clicking the converting video will give you 3 options: Pause, Open original video location, and Delete. When the convert finishes, you will find the converted video in the Finished list. 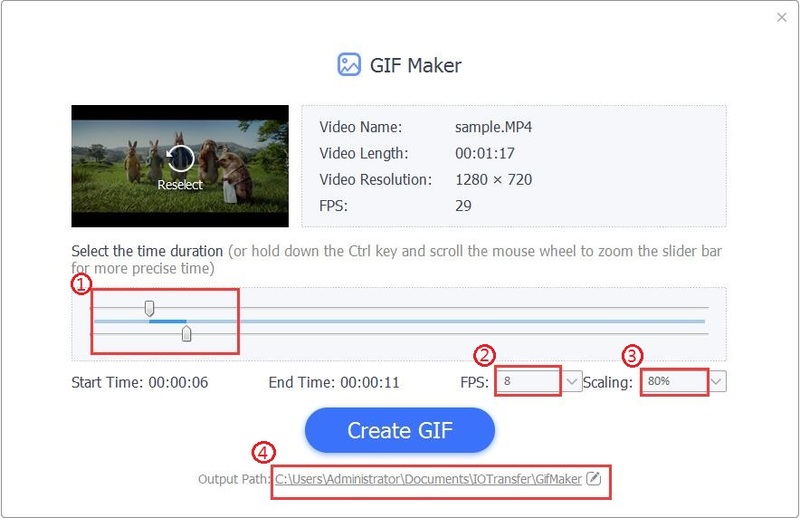 Right-clicking the converted video gives you 5 options: Transfer to device, Open original video location, Open output folder, Delete, and Delete all. 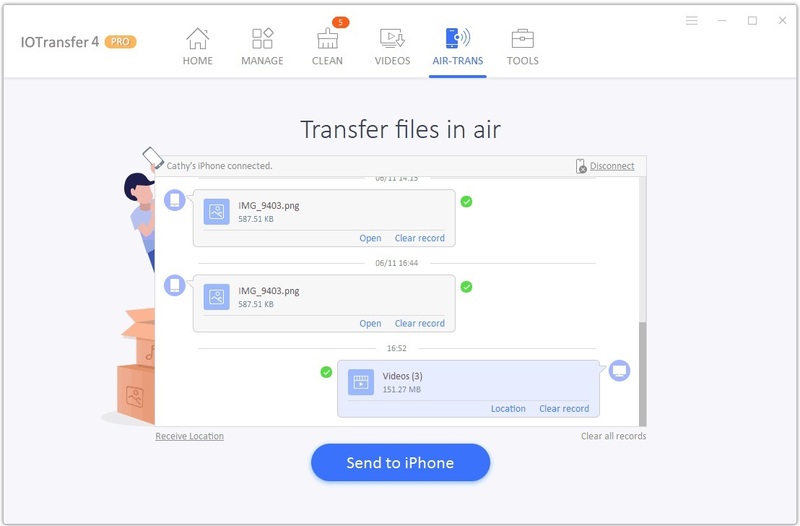 AirTrans feature helps quickly and wirelessly transfer photos, videos, music, and other files between iOS devices and computers on the same local network. 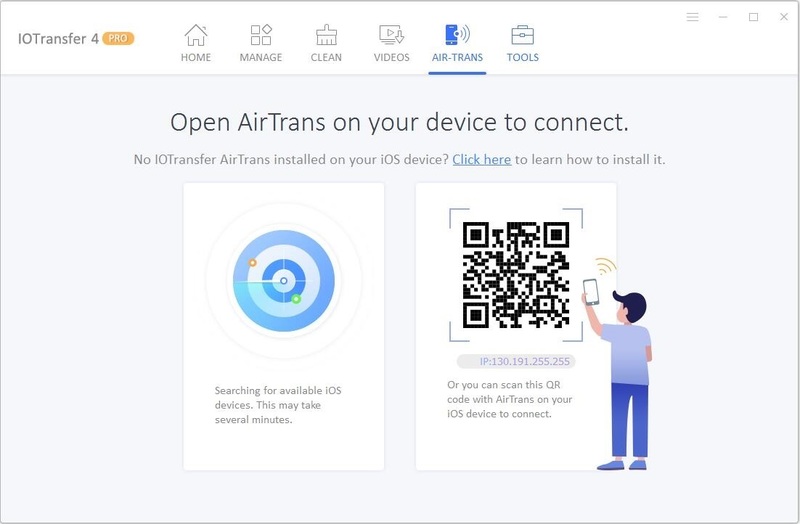 Step 1: Install IOTransfer AirTrans app on your iOS device and open it. 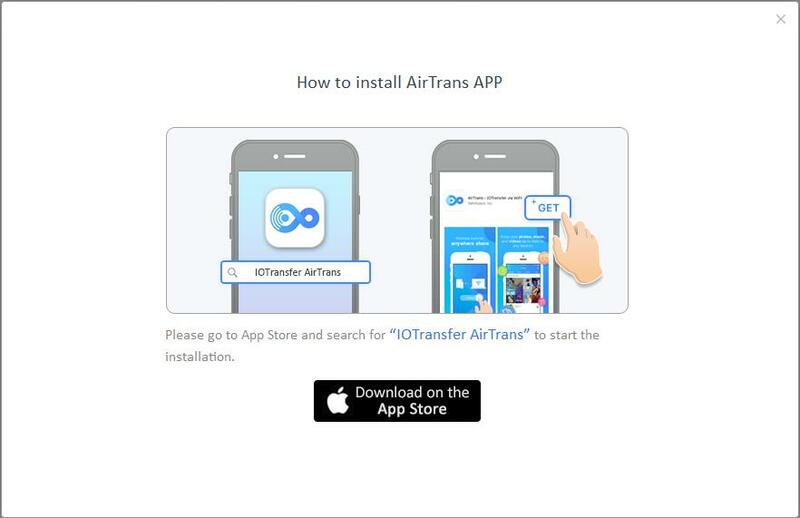 Please go to App Store and search for IOTransfer AirTrans to install it. If already installed, ignore this step. Step 2: Open IOTransfer on your PC, click AIR-TRANS tab, and then click the Start Transfer button. IOTransfer will automatically search for the available iOS device on the same network as the PC. If failed, you can scan the QR code with IOTransfer AirTrans on iOS device to complete the search. Step 3: On IOTransfer Airtrans search result page, click on the iOS device name to connect . Step 4: Click the Send to iPhone/Send to iPad/Send to iPod button to select the files you want to send to your iOS device. To send iOS device data to your PC, go through the first three steps, then click the Send to PC button in IOTransfer AirTrans on your iOS device to send files to your PC. Note: Please make sure your iOS device and the computer are always connected to the same network during the transfer process for successful wireless transfer. 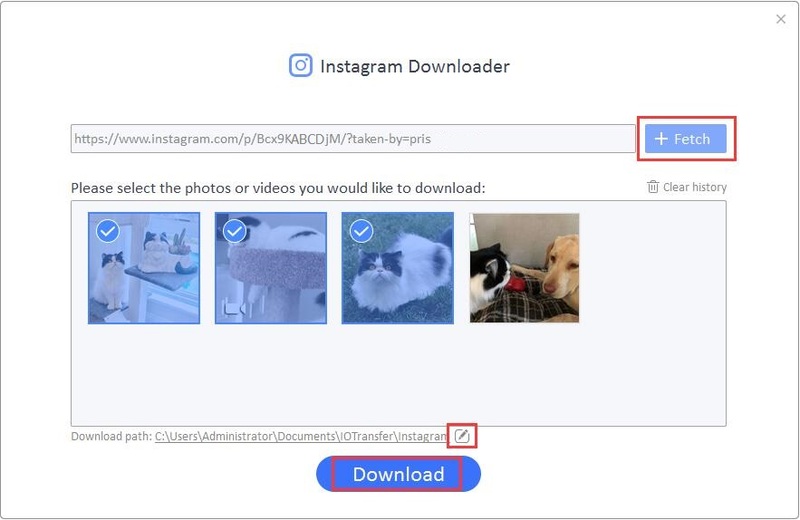 Instagram Downloader helps you easily download photos and videos from Instagram. Step 1: Open Instagram post and copy the post URL. 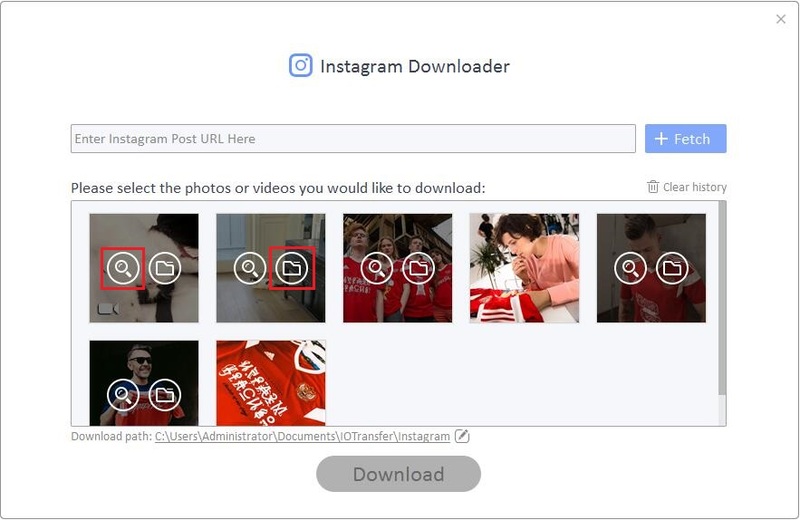 Step 2: Click the Start button to launch Instagram Downloader. The copied link will be entered to the address bar automatically. Step 3: Click the Fetch button to fetch all the photos or videos from that post link. Step 4: Tick the photos or videos you want to download. Step 5: Click the icon beside the download path to customize the path. If you prefer the default path, please ignore this step. Step 6: Click the Download button to begin the download process. Step7: After the download process completes, you can click the icon of every downloaded video/photo to view it. Or click the icon to open the folder. 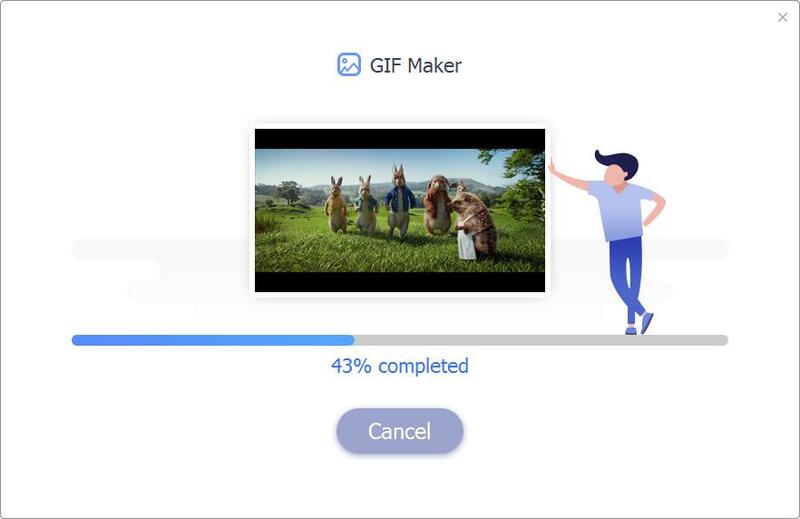 Step 1: Click the Add Video button to choose the videos from which you want to create your GIFs. Step 2: Wait a few seconds to load the video. After loading the video, you can see video information at the upper part of the window. The loading time varies due to the different size of the added video. 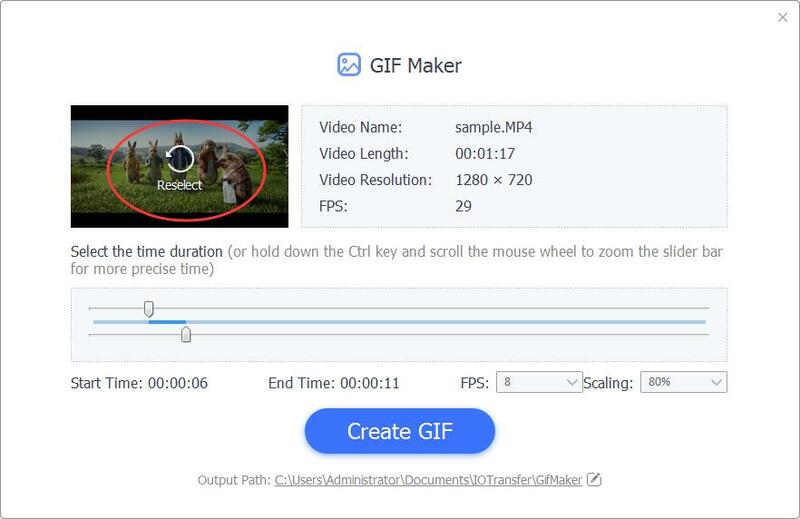 Step 3: Customize the time duration, FPS, Scaling, and choose a output path and then click the Create GIF button to start making GIF. 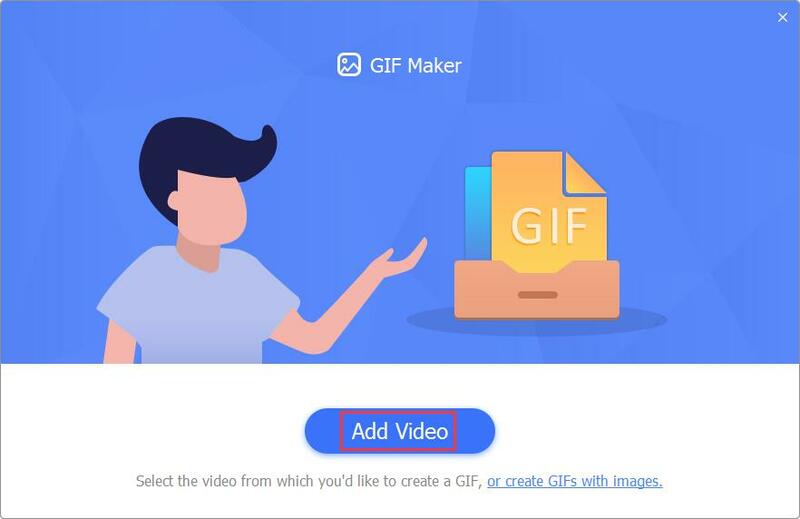 If you change your mind and want to make GIF from another video, please click the Reselect to choose another one. 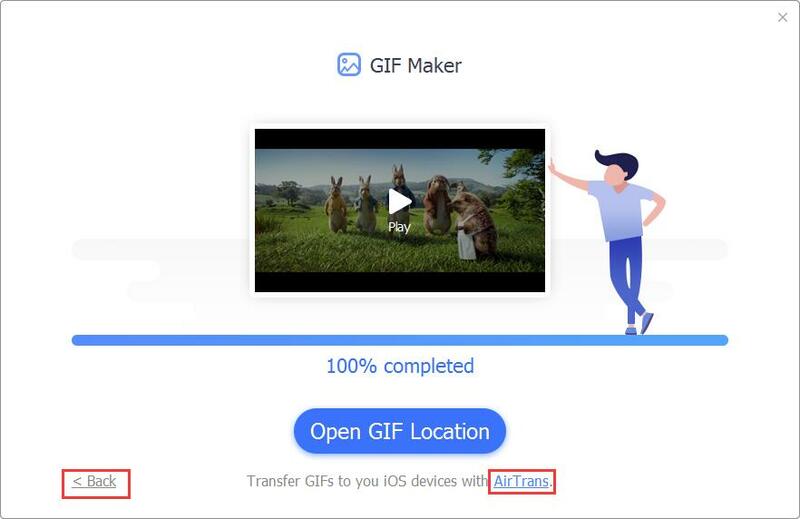 Step 4: After the process is completed, you can choose to Play it, Back to the previous window and make another GIF, or click AirTrans to transfer it to your iPhone. 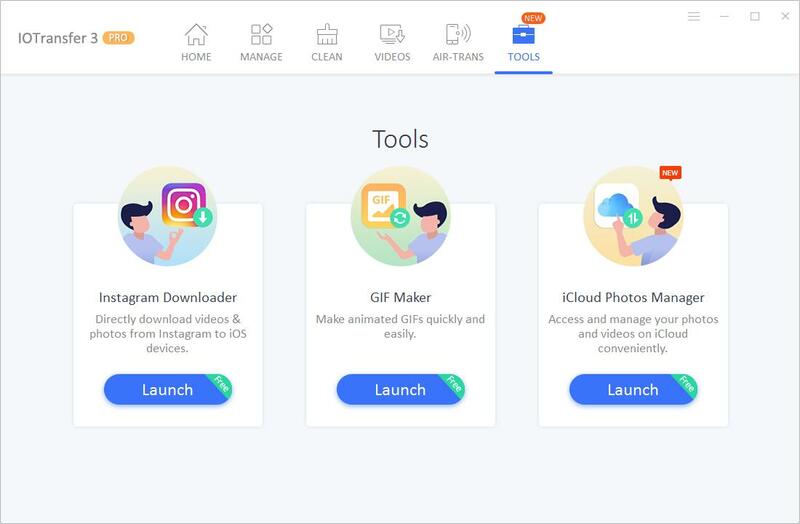 iCloud Photo Manager accesses and manages your photos and videos on iCloud conveniently without connecting your iDevices to PC. 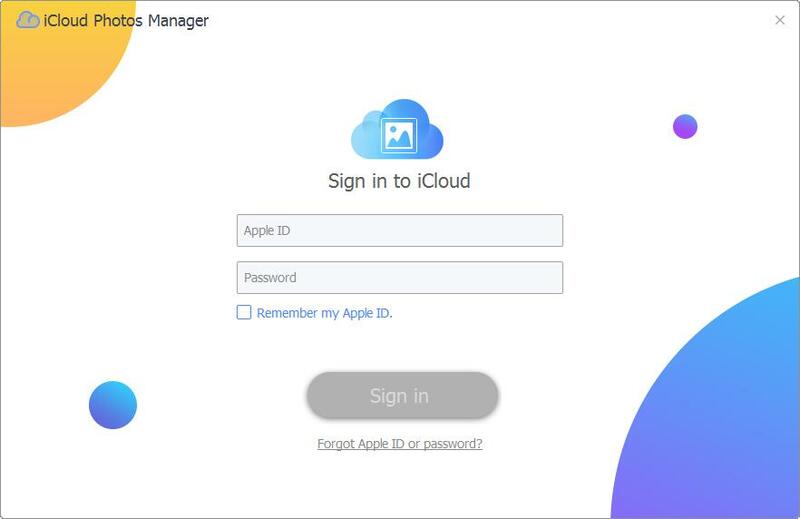 Step 1 : Sign in to iCloud with your Apple ID. If you forgot your Apple ID or password, click the Fort Apple ID or password link to recover your Apple ID. If you've enabled Two-Factor authentication, you will receive a verification code on your iPhone. Input the code and continue using iCloud Photos Manager. 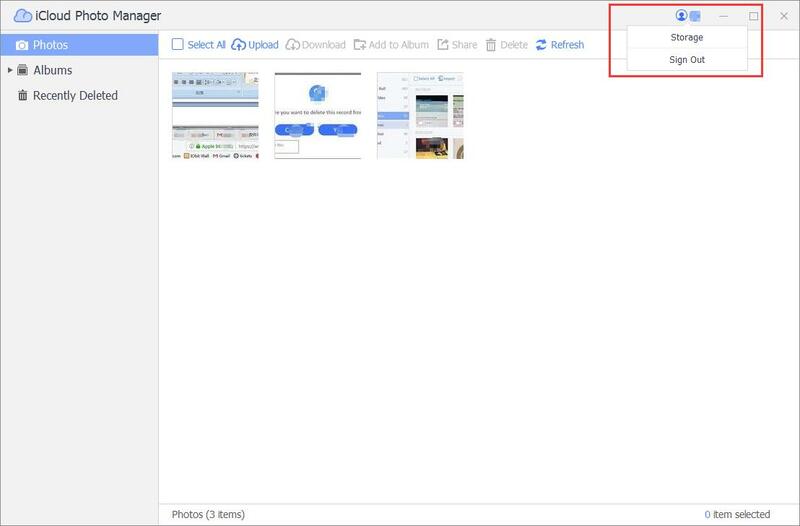 Step 2: Manage your photos and videos on iCloud. On the left panel, simply choose Photos or Albums to view them in details. Several options are provided to manage your iCloud photos conveniently. They are Select All, Upload, Download, Add to Album, Share, Delete/Remove, and Refresh. If you accidentally deleted your photos or albums, do not worry, click Recently Deleted to get them back. Step 3: When you finish managing the photos, click your name at the top right corner to sign out. Here you can also view your iCloud storage usage. More tools are under development. Please stay tuned. Click at the top right of the main screen and select Settings option to make your own settings for IOTransfer. Note: Do not forget to click OK to save your changes. It's recommended to read our FAQs before looking in the other sections for help. Because sometimes, the questions have already been answered before you ask! 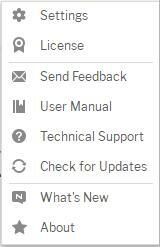 Click the icon, select Send Feedback option to open thefeedback window. Make sure your E-mail address is correct, choose proper Request type, and specify the issue in Description, so we can get back to you. Besides, it would be great if you can send us images to help us understand the issue clearly. You can click the screenshot icon to take or attach the images. If you can't find the answers on our FAQs page or fail to send feedback, please don't hesitate to contact us for email support. We will reply to you ASAP. Thanks to all IOTransfer users and beta testers who motivate us to make this product better.